Pots and pans are generally easy to move because they're durable, but their awkward shapes can make them hard to pack—and they take up a lot of space. If you're moving in town or relatively close, you can pack your pots and pans in garbage bags. But if you're moving a long distance or you're using a professional mover, you should pack your cookware in boxes. Most pots and pans need medium- to large-size moving boxes. Large boxes are best if the pans are lightweight and/or can be packed with other lightweight items. Otherwise, stick to smaller boxes so they aren't too heavy. Unlike glassware and fragile items, pots and pans don't require packing paper for protection, with the exception of glass lids, but you need some newspaper for packing material. You also need packing tape and a marker to seal the box and label it so it ends up in the right room. Place slightly scrunched-up plain newsprint or brown paper in the bottom of the moving box. Don't scrunch the paper into tight balls, but rather let it balloon on the bottom to prevent shifting during the move. Make sure all pots and pans are clean and ready to pack. Remove anything that's loose, and either pack it separately or place it inside the pot and secure it with tape. Stack the pots and pans in groups of threes, nesting smaller pots inside larger ones. Lids can be wrapped and packed separately. Wrap glass lids and other fragile or breakable items with packing paper or dish towels. Fill the box with the nested pots and pans and lids. Stuff soft, moldable kitchen items, such as sponges, cleaning cloths, and towels, into empty spaces in the box to ensure that nothing shifts during the move. Add pantry items on top, if there's room. This is the perfect place to put bags of flour, dried beans, or other pantry items that won't break. Tape the box well and mark it with "Kitchen" and a description of the packed items. If the box includes fragile items, write "Fragile" in large letters on the top, and note which end of the box is up. If desired, you can also add a number to the box, indicating the order in which the boxes should be unpacked. 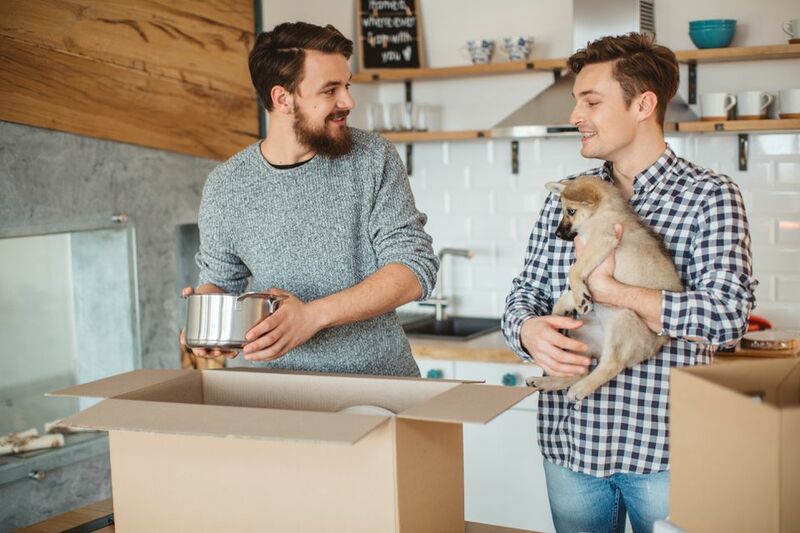 While most professional movers will tell you to always pack your stuff into moving boxes, pots and pans are the perfect things to pack into heavy-duty garbage bags, especially if you're moving locally and not a long distance. Pots and pans can be awkward to pack into moving boxes; garbage bags are a lot easier for both packing and unpacking. The only trick to this method is to tape any sharp corners so they don't poke through the plastic or damage other moving items (or you). If the bag is opaque, create a label with paper or an index card, and adhere the label to the bag with a strip of clear packing tape over the front of the label. If the bag is clear, you shouldn't need a label. When the move is over, fold or roll up the bags to reuse them later for trash.